LIVERMORE, Calif. – It sounds like something out of one of those do-it-your-self magazines: Stitch together two buck’s worth of thin-film plastic – the stuff potato chip bags are made of – stick in a photovoltaic cell, inflate with air and, voilà, you’ve got yourself a “solar balloon” that will generate a kilowatt of electricity. String together 10,000 balloons and you’ve got a solar power plant that can power a town. California startup Cool Earth Solar believes this high-low tech approach is what will make its solar power plants competitive with fossil fuels. Green Wombat visited Cool Earth’s Livermore headquarters recently for a Fortune Magazine story and got a look at the technology. “We wanted to do solar in a very different way,” says Cool Earth CEO Rob Lamkin. Different it is. We’re standing in Cool Earth’s back shop in front of an eight-foot-high solar balloon. Two pounds of plastic are pumped with a third of a pound of air per square inch to make the balloon taut. The curved top two-thirds of the balloon is transparent and the bottom is made of the silvery reflective plastic you’d find lining a bag of junk food. A steel strut inside will hold a tiny but highly efficient solar cell, which is the most high-tech component of the balloon. 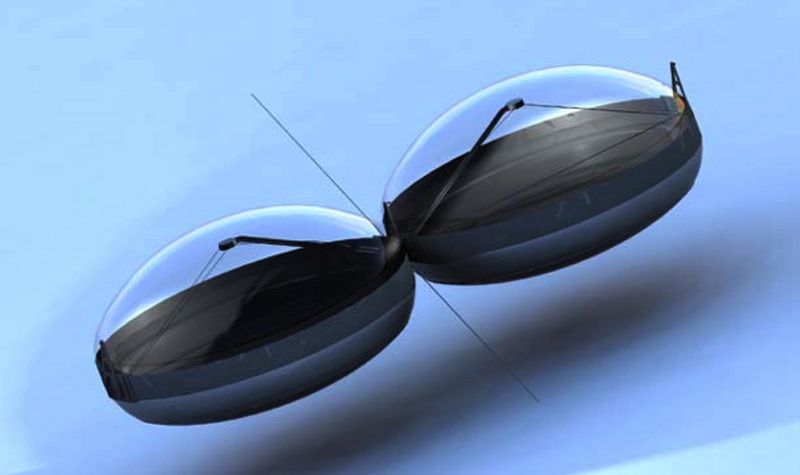 Here’s the ingenious part of the technology, developed by scientists at Caltech: Instead of using expensive optics to concentrate sunlight on the solar cell, Cool Earth manipulates the air pressure inside the balloon to change the shape of the mirrored surface so that it focuses the maximum amount of sunlight on the solar cell, boosting electricity generation 300 to 400 times. By replacing expensive materials like steel with cheap-as-chips plastic and air, Cool Earth aims to dramatically lower the price of solar electricity. “We strongly believe it’s all about cost,” says Lamkin, “not how clever the technology is or if it is 1% more efficient.” For instance, the amount of aluminum in a can of Coke would provide enough reflective material for 750 balloons, he notes. The company, founded in 2007, has raised $21 million so far. It plans to build solar power stations in the 10-megawatt to 30-megawatt range. Two to six balloons will be suspended on wood poles and anchored with cables about 10 feet off the ground. That means the earth won’t have to be graded, reducing the environmental impact of Cool Earth’s power plants – a growing issue given that most solar thermal power stations will be built in the desert, home to a plethora of protected wildlife. The relatively compact size of Cool Earth’s power stations also means they can be located close to existing transmission lines. A prototype power plant is being built in a field across the street from Cool Earth’s offices and Lamkin says a 1.5 megawatt plant will be constructed early next year in the Central Valley town of Tracy. The electricity probably will be sold to utility PG&E (PCG) under a state renewable energy program. Unlike big solar thermal plants, photovoltaic power stations do not need to obtain a license from the California Energy Commission, which can be an expensive two-year ordeal. Lamkin estimates that a Cool Earth power plant can be up and running in six months, which should appeal to utilities like PG&E, Southern California Edison (EIX) and San Diego Gas & Electric (SRE), which are under the gun to meet state mandates to obtain 20% of their electricity from renewable sources by 2010. Now Cool Earth just needs to make the technology work in the field. It has yet to produce electricity from its balloons, as the solar cells are still being produced. Also unknown is how the balloons will operate in real-world conditions. Lamkin says they can withstand 125-mile-an-hour winds. They have a lifespan of just five years, but Cool Earth expects to replace the balloons every year, given their low cost. What happens on windy days? what abt the teethering cost?how will u use the underbelly area of the balloon which is away from the sun? great idea, its just a pity the solar cells it needs (1 Kilowatt per cell!?) don’t exist. Oh, just replace all the plastic film balloons every year? What environmentally-responsible power generation! When the wavelengths of light that create the electricity are highly concentrated, the light-to-electricity efficiency increases enormously. That is well known. The problem is the undesirable wavelengths of light, notably infrared, are also highly concentrated, and the solar cell heats up and the efficiency drops. Worse, at higher temperatures, corrosion begins – the atmospheric oxygen’s attacks also become highly efficient. Then there is the wiring to the solar cell itself, copper oxidizes easily at higher temperatures. Insulation has to be high-temperature-rated. Remember, this is a solar furnace! There is also the risk of temperatures rising high enough to affect the structural integrity of the silicon cell itself, over time leading to degradation of the crystalline structure. So the real trick is to remove much of the infrared wavelengths from the incipient radiation and you will have a very good power generator. I don’t know how much concentrated ultraviolet will do to the solar cell or whether the plastic balloon material will block most of the ultraviolet wavelengths. UV light is more degrading to plastics than are the other wavelengths, plastics like the insulation on wiring. What about the flying critters in the sky that have been known to take down whole airplanes? Another stupid idea from stupid environmentalists! DRILL, BABY, DRILL!!! AND CLEAN COAL THAT WE NEED TO GENERATE ELECTRICITY, WHICH OBAMA PLANS TO BANKRUPT THE COAL INDUSTRY. THANK YOU ALL YOU MORON AMERICANS WHO VOTED FOR THIS CLOWN! republican drill-ignoramus me-shell, you need to go get your ged before commenting. i’ve worked in the energy generation for 25 years and the level of comments here staggers me. clean coal? what a joke. i’ve actually been to the doe-built coal gasification plant in n dakota. it didnt work then and it wont now. let chrysler retool to manufacture components of the new nat’l electric grid. that alone would give a 40% gain in transmission line efficiency. you’d never have to build another coal-fired or nuclear plant in this country -ever- again. and as the in-service plants complete their useful life, you could replace them with solar balloons or better the parabolic type in conjunction with wind and other renewables. let the federal govt buy an old oil refinery leasing out its operation to maintain gasoline price discipline so oil co’s cant bone, expand railroads reducing congestion on highways and extending their lifespan. thats a great start eliminating importation of foreign oil, reducing the energy monopolies ability to screw us. Don’t just blame the republicans because members of congress from both parties take hundreds of millions of dollars in energy and auto industry influenced donations. Look at their voting records and drill baby drill is as much a democratic congress person’s mantra. Even Obama waffled on that one during the campaign while he knew it wasn’t an answer. GOOD IDEA ! HAY LETS GIVE IT A TRY. ITS NOT VERY WINDY IN TRACY ,SO WIND SHOULD NOT BE A PROBLEM. THIS IS NOT ABOUT RIGHT OR LEFT ,ITS ABOUT WILL THERE BE A U.S.A. IF WE DONT FIND NEW POWER-TEC TO SELL TO OTHERS SO GET OFF THE OLD TRAIN AND GET WITH THE NEW, OR MOVE TO THE THIRD WORLD ,ILL WRITE YOU WHEN YOU GET THERE! Throw two ballons on every telephone poll in North America. Hello solution to the energy crisis. I doubt that exists photovoltaic cell to survive even x100 solar flux. A question is that public company? ARE THEY SHOWING WORKABLE PROTOTYPE AFTER 21 MILLION AND FEW YEARS DEVELOPMENT? It is May 30.2009 and it looks like vaporware still no power generation and more money down the drain. 3D computer generation of images does not count for power generation.